Get started with our BEST lighting offer of the year! Every Season. Every Landscape Need. We have the only CLVLT (Certified Low Voltage Lighting Technician) in the triad! Want to look at materials? Stop by our shop to check out our furniture line! 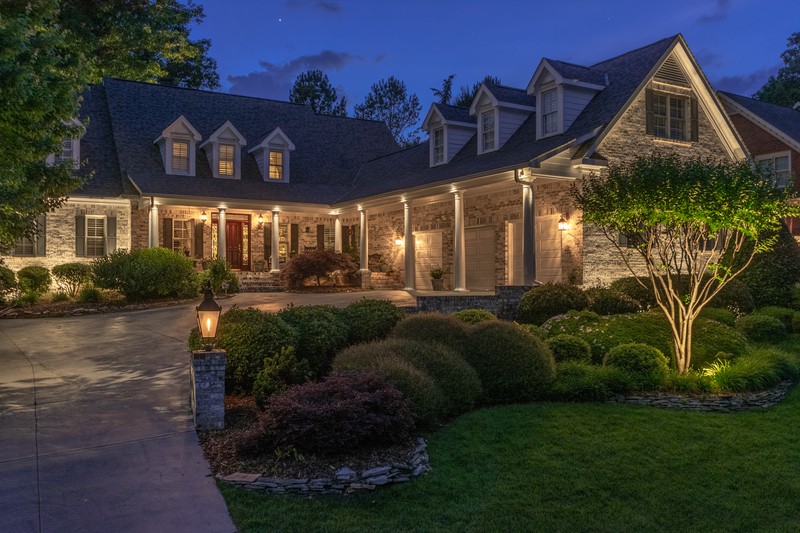 Southern Exposure is the leading full-service provider of home & commercial landscape services, outdoor hardscapes (patios, retaining walls, walkways, outdoor kitchens, stonework, outdoor bars, custom fireplaces & firepits), and outdoor landscape lighting and audio in Greensboro, North Carolina, and surrounding Piedmont Triad areas of Summerfield, Oak Ridge, Kernersville, Stokesdale, Colfax, and Browns Summit. Specializing in design, installation and management for both residential and commercial properties, Southern Exposure is fully licensed and utilizes only the highest quality and environmentally friendly green products. In additional to our extensive experience in the Green Industry providing professional landscaping and hardscaping services, we also design, install and maintain drainage systems, outdoor landscape lighting systems, outdoor audio systems and offer winter services such as pre-treatment plans for snow & ice and also winter storm cleanups. Southern Exposure Landscape Management is your one-stop-shop for all of your landscape needs. We offer a variety of services and hold more certifications than any other landscape company in the area. Click to learn about our available services. Each new season brings opportunities for growth. We offer a variety of specials throughout the year that are only here for a limited time. Take advantage of these major discounts while you still can. Southern Exposure offers a wide range of Patio Furniture that is handcrafted in Greensboro, NC! Come by our shop to check out our sample pieces and all the different fabric choices or you can click the image to check out all available pieces. First class work and professionalism. Quote on time. Completed work when promised. Cleaned up meticulously. Employees were respectful and kind. This is the second time I worked with SE. I'm a repeat customer because they deserve it. And will do it again. As a customer of Southern Exposure for 10 plus years I have to give an “A+” rating on the service and quality of work I had all those years. Not only have they been responsive in my needs and extra work but the politeness was over the top, from the management down to the yard men. I have been working with Southern Exposure for almost 8 years and two homes and they have always done fantastic work. I have referred them to many others who say the same. Their responsiveness, attention to detail, and knowledge is impeccable. The landscape crew from Southern Exposure does a considerably better job than any other company that I have ever used before. Their work is quality!!!! The foreman told the other workers what to do and they did exactly what I wanted. They kept to the job at hand and paid attention to detail. It was a very smooth process and the results were beautiful. Southern Exposure crews are always dependable, they are attentive to details, and their quality of work are second to none. I could not believe I received a call on Saturday (a day when the office is usually closed), to let me know the Snow Removal Team would be at my house on Sunday between 9:00 am and noon. They were there, and did an unbelievable job (according to my wife), of removing ALL the snow and ice from our walk and drive. Thanks so much! While my patio improvement was not a large project, the staff took time to suggest options, show me available materials and make sure my priorities were met! Couldn't be more pleased with the end result. It will be great to host family and friends this summer on my new patio and grow tomatoes in the raised garden area! Southern Exposure Landscape Management's service is second to none. From the office to job site and quality of the work is ten times better than any company we have ever used. Would highly recommend them for any outdoor project! The results from working with Southern Exposure exceeded my expectations. I'm fairly particular and detail oriented, but Brian's care and attention to the project earned my trust. Everyone was very accommodating and focused on providing us with a final product we were all proud of. We had a great experience with Southern Exposure! They recently completed a landscaping project in our front garden beds. Matt worked diligently to meet our budget requirements, purchased beautiful plants for our landscape, and scheduled our installation promptly. Justin, Ruben and Ralo did wonderful work on the installation. They worked around our existing landscape lighting (from Southern Lights). They also did a great job with mulching and cleanup. We are so pleased with our landscape! We were extremely happy with our patio and landscaping that was installed by Southern Exposure. Everyone we worked with was very professional and the patio looks amazing. Matt and Brian, among others, helped through unforeseen issues and took us step-by-step through the process. Their advice was sound and communication was very good throughout the process. We would definitely recommend this company! When and how to prune your shrubs and trees. Tips to maintain your lawn like PROS!